The “halo” style charging ring is now available for your Ruger® MarkIV, MarkIII and Mark III 22/45 pistols! Tired of sore and pinched fingers from charging your Ruger® MarkIV or Ruger® MarkIII? 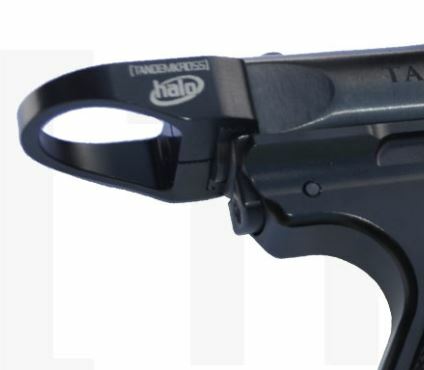 Upgrade your pistol with the NEW “halo” Charging Handle for Ruger® MKIV, MKIII and 22/45! The pull ring charging handle is modeled after Tandemkross' popular “halo” Charging Ring for Browning Buck Mark and SW22® Victory™, and features a smooth, curved ring for improved leverage and easy charging for all users - whether right- or left-handed. The ambidextrous design also works with a holster. The "halo" Charging Ring is an ideal upgrade for competition shooters who may need to charge the pistol or clear a jam quickly. For junior and senior shooters, overcoming the hammer can also be a serious challenge. Made of lightweight, aircraft grade aluminum, the “halo” Charging Ring for Ruger® Mark IV and Ruger® Mark III pistols improves grip and leverage for easier charging, without adding extra weight to the back of the pistol or impacting the pistol's action.